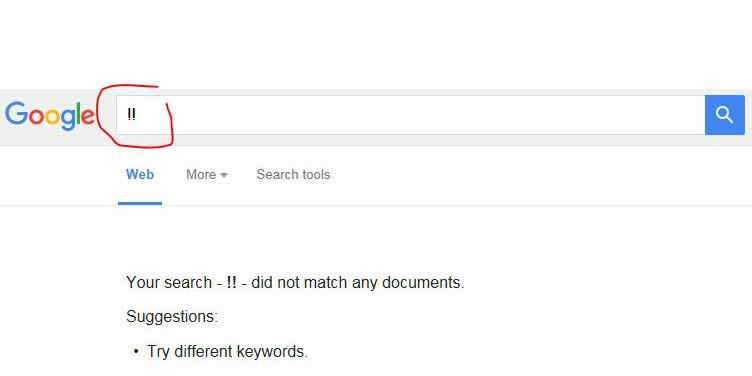 There aren’t many searches that result in “Your search did not match any documents” on Google and as the worlds biggest search engine refines its search algorithms it’s unlikely to be beaten – or is it? Many years ago in the early days of search engine optimisation development we discovered that the first letter of the keyboard alphabet is not an ‘A’ as we all assume, but ‘!’ – the exclamation mark. With this knowledge it was easy to trick simple search engines if we used the exclamation mark as part of the title or reference text cached by the search database. For example we were top of all searches on the local Chamber of Commerce website for months, in the end their developers called and asked how we were doing it (suspecting we’d hacked their database). Eventually they all caught up with us and search programming moved on but we continued to use the double exclamation mark (!!) in all our clients <title> tags (part of the hidden source code text used by search engines to evaluate content). This helped us find the thousands of web pages we’ve created over the past 15 years. Surprisingly even to this day even Google struggles with the double exclamation mark and as you can see above, gives a no result. Probably the shortest characters length search string that gives a 0 result. This allows us to continue with the !! practice and helps you find your pages quickly (and hopefully top) on SERPs (search engine results pages). ← Previous Previous post: Looking for website designers in Deal?